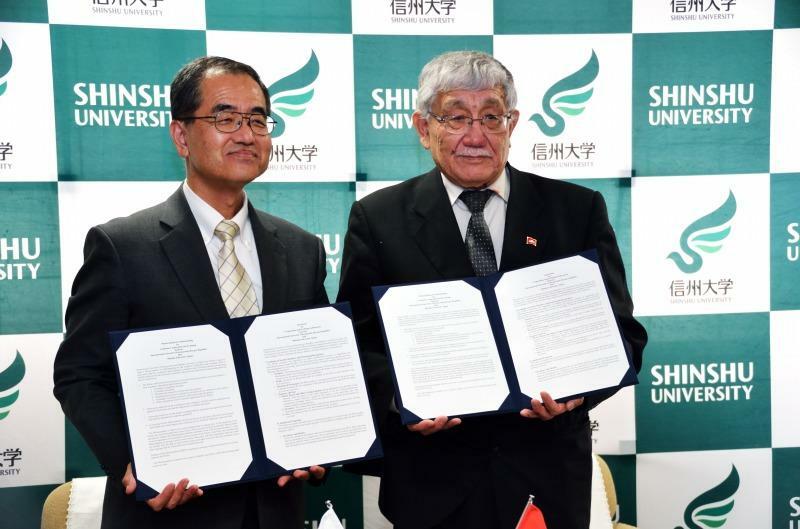 On October 18, 2016, Shinshu University Japan signed an academic exchange agreement with International University of Kyrgyzstan (IUK) of the Kyrgyz Republic (Kyrgyzstan). Representatives from IUK, President Academician Asylbek A. Aidaraliev along with Mr. Maksatbek Anarbaev, and representatives from Shinshu University, President Dr. Kunihiro Hamada, Trustee Dr. Mitsuo Takeda (in charge of Management and Strategic Planning, Financial Management, Information), Vice President and Global Education Center Director Prof. Kiyoshi Tanaka (in charge of International Affairs), Global Education Center Vice Director Prof. Tomonori Sato, and Director of Institute of Mountain Science Prof. Shigeyuki Izumiyama attended the official signing ceremony held in the Shinshu University president's reception room. IUK was established in 1993 under president Askar Akayev (president of Kyrgyzstan at the time) focusing on the university's School of Medicine. IUK has approximately 1,800 students. It consists of a university hospital, as well as faculties such as the schools of biological sciences, computer science, history and philosophy of science, etc. Language courses, doctoral programs, research facilities and an education center are also available alongside a variety of international programs. With the signing of this latest academic exchange agreement, all parties involved are looking forward to the development and expansion of inter-university academic exchanges that will take advantage of the unique characteristics and strengths of both universities’ research and education efforts.